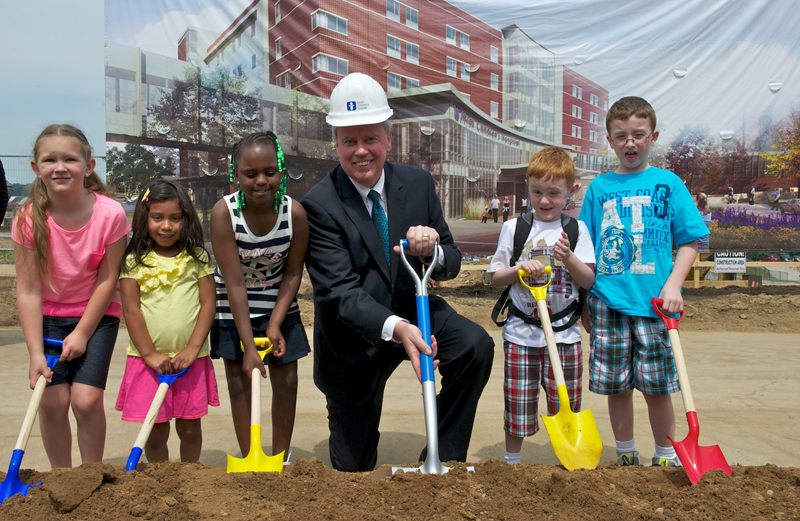 Hospital President and CEO Bill Considine gets ready to shovel the ceremonial dirt with several kids. Akron Children’s Hospital celebrated the expansion of its Akron campus with a groundbreaking ceremony at 11 a.m. on May 30 in Perkins Square Park. The backdrop of the event was the construction site. The event started with brief remarks from Akron Children’s president and CEO Bill Considine, other hospital leaders, elected officials and a parent. “We’re here today to celebrate the future of Akron Children’s Hospital and the future of healthcare for the children and families we care for throughout northern Ohio,” said Grace Wakulchik, Akron Children’s vice president of operations and chief operating officer. A dirt turning ceremony followed the concluding remarks. Considine and some children were the first to get their “hands dirty,” while shoveling the ceremonial dirt. Members of the neonatal intensive care unit (NICU) and of the operations team also participated. To watch the progress since the construction began this spring, view the live Web cam and view the photo gallery below to see the ceremony.